Leesta Vall Sound Recordings, a Brooklyn-based talent booking agency and niche record label, has began offering direct-to-vinyl recording sessions. 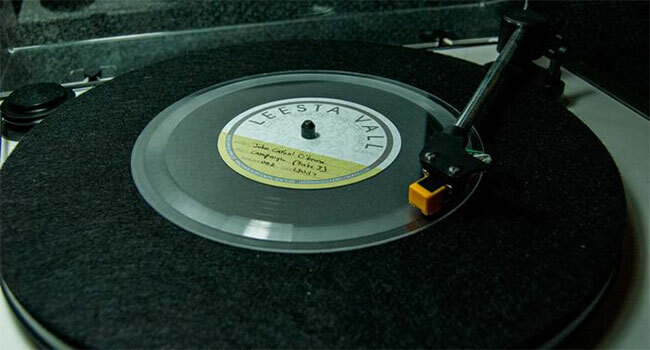 Leesta Vall Direct-To-Vinyl Office Sessions, which are live performances from their office, are cut directly to 7” vinyl records with no tracking or overdubs of any kind. Acts play the song live with the audio cut directly to limited edition lathe cut vinyl. Each release is truly unique as it’s one-of-a-kind. These Lo-Fi mono sessions are becoming more popular with vinyl enthusiasts. Aaron Zimmer is the owner and recently took some time to discuss how the project came about, the difference between lathe cut vinyl and pressed vinyl and more. This is truly a unique project. Please tell us how the idea of recording single takes directly to vinyl came about. We have a roster of about twenty to twenty-five bands that tour and we manage all of their U.S. booking that equates to one thousand or twelve hundred shows a year, so that’s really where business is. The direct to vinyl project started in my office. The booking agency founded a small niche label a year or two ago. The idea behind the label was to just do limited edition lathe cut records. I have a great love of vinyl and all things old, especially old musical equipment like that, so I spent a year or two leading up to this time researching, and finally bought a lathe from the Fifties and spent another year learning how to use it correctly. When the label launched, we put out twenty releases in that first year. It was all mixed and mastered unreleased music. It might have only had a digital release otherwise, but our bands wanted to have something they could sell on the road. Even if they only needed twenty copies or whatever, we were able to help them get that. That’s where the lathe cut records began. Why “office sessions” instead of actual live shows? Initially, I thought it would be really great to record live shows directly to vinyl. That’s actually what I bought all the equipment and started learning, that’s what I thought we’d do. The equipment is so old and it’s so heavy and it breaks down easily. It’s not very mobile. So, we kinda just conjured up this idea of ‘office sessions’ as sort of the opposite of that. So, rather than going with the musicians to the show, we have them come in and give us an opportunity with the kind of setting that we could put up a bunch of microphones and analog out board gear, and really get good sounding recording going onto these records. For those who are unaware of the recording process, how does this differ from a typical session? What I love about the project is that the product itself is so scarce. There’s no duplication at all. I don’t even preserve the session. An ensemble comes in – group or solo person or whoever it is – they perform a song. As they’re performing it, the lathe cuts the audio directly to that record. That’s the only preservation of that take or presentation of that song there is. To me, that’s what makes it so special. Somebody who’s going to buy this record understands that first of all, it’s very scarce. It’s a record, number one, that’s cool. But there’s only one copy of that in existence in the world and the only way to hear it is on that one little record, and that’s what I love about it. How does a typical “office session” work? When artists come in, we’ll have them play ten songs or fifteen songs. Maybe it’s the same song fifteen times. Maybe it’s three songs five different times. However, they want to split the session up, we can do whatever. Each time they play the song, that’s one record. Play the song again, that’s two. The sessions have ten or fifteen copies, but there’s no duplication beyond that. It’s not as though they come in and then they [duplicate] ten copies of that song on a limited edition record. We’re not even preserving it at all. They play it. It gets carved into the record and that’s it. We’ve been through about 450 records in 30 sessions. What is the difference between lathe cut records and mass produced records? Lathe cut records are different than pressed records. The biggest difference is that a pressed record has the grooves pressed into hot melted wax. This isn’t that way. It isn’t a pressed record. They’re cut individually. So rather than being pressed, the groove is cut out using a machine from the 1950’s. It’s done not on actual vinyl at all. It’s plastic made similarly to vinyl. It’s very similar to PVC. Because of these things, the fidelity’s a little bit different. The machine is from the Fifties, we’re cutting in mono. Because we’re cutting the groove in rather than pressing it onto hot wax, there could be particles from cutting the record in those grooves and what that does creates extra pops and cracks or maybe extra surface noise and what we find is the more they’re played, the better they start to sound. It is a strange nichey product and they don’t play well on junky turn tables. Generally these lathe cut records need to have the tonearm weight maxed out. If you don’t have a lot of weight on the tonearm, it’s more apt to skip. Do you allow artists to digitize their tracks and share online? Digitizing the direct to vinyl stuff, in my view — and maybe I’m sort of a snob about it — but that’d be a direct slap in the face to the project itself — to take that one person’s copy, that one presentation of a song, and then digitize it for anybody to hear — it lessens the value of the record itself. I would hope that people didn’t do that. I’d be surprised if musicians did that. There are hundreds of ways to listen to digital music. They might as well just go on Spotify. There’d be no reason for them to devalue this particular project. I haven’t heard of anyone doing that. I’d discourage it, but people are going to do what they’re going to do. Besides Jack White’s Third Man Records, there doesn’t seem to be many direct to vinyl options around. Jack’s got two different things going on. He’s got some lathe cut things happening for sure. If you go to Third Man’s Record Store, he has one of the old original booths in that record store, meaning if you bring your guitar to his record store, you pay him $20 and you go into the booth and record and perform the song and it cuts the record right there in the booth with you and spits it out like a candy machine. [Ours is] exactly like that, only it’s just using that same model and making it so the artist can monetize it and sell it to their fans. Even if we’re only going to sell ten records to their ten biggest fans. [White’s] doing it. I’ve been hearing of a couple of studios. There’s one in Austin called Austin Signal that’s doing some direct to vinyl stuff that seems pretty cool, and I think there’s another in Toledo maybe, but yeah, not very many of us out there, that’s for sure. Does it cost anything to record? There’s no fees. It’s sorta of a community thing. [Artists] can make a little bit of money and we can make a little bit of money. It’s just a cool little vanity project that was too cool not to do. Can any artist, band or solo, show up to your office and begin recording? We’re gonna be pretty exclusive about who comes in. It’s not just anybody who can come in and do it. We wanna really like the music first. Artists who are interested in recording direct to vinyl can visit their website and apply.